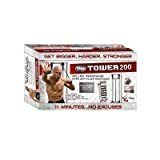 Anyone Try Body by Jake Tower 200? Anyone try the Body by Jake Tower 200? My husband is wanting to try it because a buddy in Kuwait said it's the ultimate workout without having a gym. I worry most about how sturdy it is and assume it's based on the hardware of the door. We have a double French door and not sure it will hold up and since we are renting, not too keen on damaging a door. I did read the reviews and overall, it received decent reviews and no one else had too harsh reviews on the sturdiness. I was thinking of getting it for him for his birthday since he left his Bowflex behind when we moved hoping to try out this. It's on sale through Amazon but I also want to ensure it's a good product. I've got one and I really like it. If he is wanting to lift a lot of weight, then you might want to get the add on package that has a pull down bar and extra tension (weight) bands along with nicer hand grips and some more DVDs. Mine is on an exterior exit door with glass on the top half. It is very sturdy on it. If properly mounted, it won't damage the door at all. Thanks for your feedback! I worried mostly about the door but it sounds like it will be fine. I'll tell him about the add on package. Thanks again!